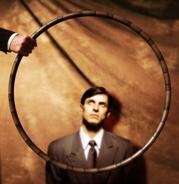 Bible in the Basement: Church Membership: Just Another Hoop? Most local gyms require “membership,” defined by a contract and a membership fee. I wish that I could just pay a small fee whenever I utilize the gym, instead of signing my life (or at least my year) away. Instead, a costlier commitment is demanded – and this is called membership. Obviously this is in the best interests of their business and bottom line. Yet for me, it seems like just a hoop to jump through to get to the weight room. It’s no wonder that so many people cringe at the idea of church membership. They hear the word “membership” and think of an unnecessary loophole. Why “join” a church when one can simply “attend”? Why sign a contract, so to speak, that will limit one’s freedom – after all, you may or may not still want to attend this church next year … or even next month. How can these passages be obeyed without a commitment to a local congregation? A clear commitment to a specific church and its leaders is necessary. And the way that commitment is clarified is called church membership. In short, church membership is not about us. It’s about clarifying our commitment to others in the congregation and to church leaders, for mutual encouragement and accountability. Much like membership at a gym, church membership keeps us accountable to our goals – in this case, our spiritual goals. If so many can make a commitment to a local gym, in order to care for their own body, can’t we make a commitment to a local church? Though in this case, we are not the sole (or “soul”) recipient – because it’s not just about us. I also think it is important to affirm that Christ has placed certain governing power in the church. Submission to the body of Christ is not optional as is a club membership. This is related to the problem with independent/congregationalist church polity, though that is a whole 'nother discussion. I originally planned to contrast church membership, rather than compare it, with membership at the local gym. But as I thought about it, I found those similarities. You bring up a good point -- thanks! I think Church leaders need refresher courses on how to lead their sheep/members. They often take a back seat to leadership until it's too late. This is why some people lack the initiative to commiting to membership... mutual accountability is needed now more than ever.